If you’re still contemplating what material you should use for you’re the flooring in the kitchen, then look no further. We’ve got the best option to offer you – we think you should use oak hardwood flooring for your kitchen. 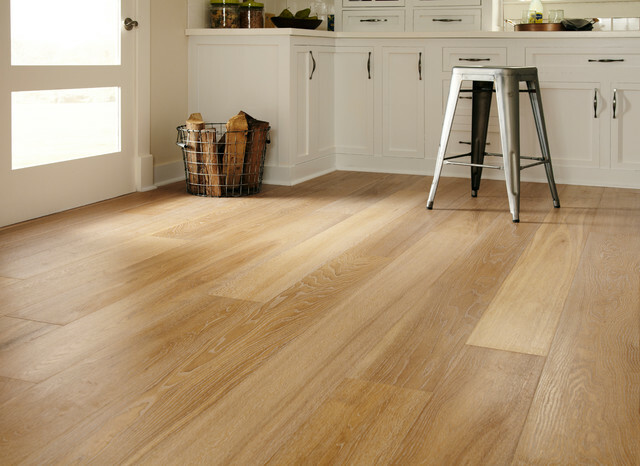 There are a number of reasons why this flooring is a great choice for this room in your home. Check them out. Oak hardwood flooring is great for withstanding the amount of traffic, the spills, drops and other things on your floor. It can also stand up to the demands of the busy foot traffic that’s going to be happening, especially throughout the more festive seasons of the year. All you have to do is ensure that you take care of it correctly. It needs to be cleaned and maintained so that it can stand up to the demands of the kitchen. Oak hardwood flooring also has a number of stunning natural grains and textures that can easily hide any blemishes that occur over the years. It will help to preserve the aesthetics of the floor and of the entire kitchen. Oak hardwood flooring never goes out of style. It is a timeless beauty, although you can choose to change or update it by doing a number of simple things which include sanding, refinishing and resealing it so that it will fit into your new décor theme. Oak hardwood flooring can add value to your kitchen and to your entire home. It is one of those floors which is deemed as very desirable to potential buyers. These floors tends to retain their value over time and can significantly add value to your home and to your life.